Photographer's Note: "Really enjoyed Doan's Crossing. This may not be Sugar but may be an offspring. Too friendly. They asked me to stay but I just couldn't. Don't think they understood." Vernon's 19th Century history is closely bound to the Red River crossing some 15 miles north. 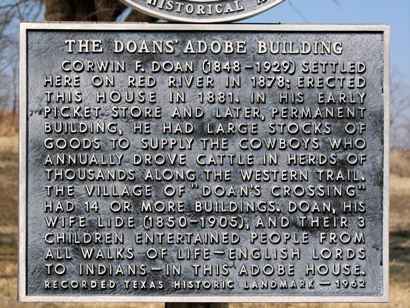 Corwin Doan operated a store at this point and supplied cowboys with all they needed to survive the trip. This is where an estimated six million Longhorn cattle crossed on their way to the railheads in Dodge City, Kansas. The fencing of the west and the invention of barbed wire put an end to the cattle drives that brought Texas back from the economic collapse brought upon by the Civil War. 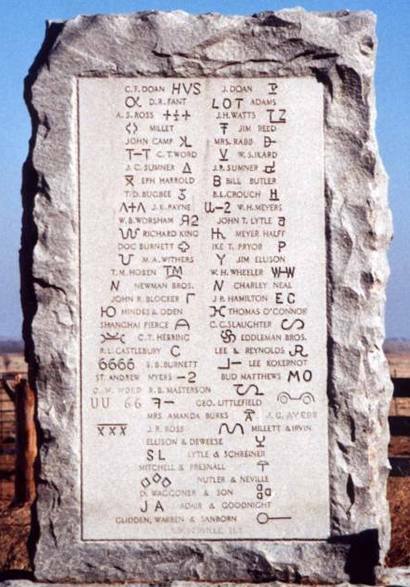 There is a large granite marker that includes many of the brands of the most famous ranches in Texas. Beside the marker, there is the adobe structure that was originally the store, and little else. You cannot see the river from this point, since the crossing proper is on private property. A major route for cattle drives known primarily as the Western Trail developed from far South Texas to Dodge City, Kansas, in the 1870s. About 1876, trail drivers along the route began crossing the Red River near this site. 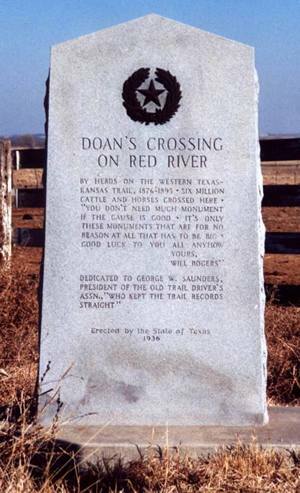 In 1878, Ohio native Jonathan Doan established a trading post near the crossing and became the first person to permanently settle in Wilbarger County (organized in 1881). 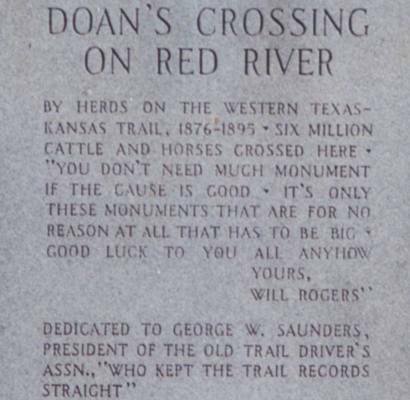 In the early 1880s he and his partner/nephew Corwin F. Doan recorded the passage of hundreds of thousands of cattle along this river crossing which became known as Doan's Crossing. 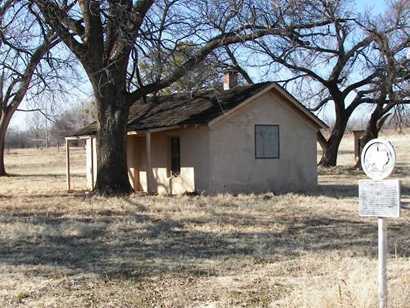 Corwin F. Doan (1848-1929) settled here on Red River in 1878; erected this house in 1881. In his early picket store and later, permanent building, he had large stocks of goods to supply the cowboys who annually drove cattle in herds of thousands along the Western Trail. The village of "Doan's Crossing" had 14 or more buildings. 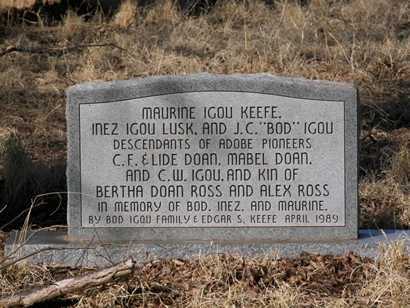 Doan, his wife Lide (1850-1905), and their 3 children entertained people from all walks of life -- English Lords to Indians -- in this adobe house. By herds on the Western Texas-Kansas Trail, 1876-1895, six million cattle and horses crossed here. "You don't need much monument if the cause is good. It's only these monuments that are for no reason at all that has to be big. Good luck to you all anyhow. Dedicated to George W. Saunders, President of the Old Trail Driver's Association, "Who kept the trail records straight." Doan's Crossing is policed 7 days a week by an intelligent and curious canine that ignored our request for his name. We assume he is counting the days until the picnic. This year's (2000) picnic will occur on Saturday May the 6th. 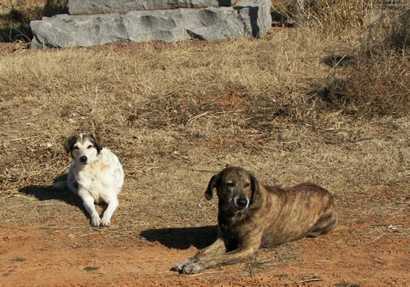 I loved Tuffy's story, and you're a wise man to prefer to write about the animals you meet rather than the people. Since quite a few folk drop by here at Doans there are also a few animals kicked out out here, and using the secret sense they have that points unerringly to suckers, they come to our door. All that we allow them is a bowl with their new name on it, veterinary care for life, and all that they can eat -- forever. Sugar was a refugee and she now has her own couch in the garage. Beaumont, the wild boar, was orphaned during an early freeze on a ranch near Matador. A "friend" brought him to me when he was about ten inches long. For a time he lived in the house, and he very quickly imprinted on me. He would stand up by my recliner and squeal until I picked him up and put him in my lap. After having a veterinarian neuter him, we put him outside and for years he never left the yard, but when he started excavating the neighbor's yard he had to go into a pen. He now weighs about 550 pounds and excavates horseshoes, pieces of trace chain, and other metal implements, which lead me to believe that his pen overlies an old blacksmith shop in greater Doans. In his younger days he would furtively approach one of our cats from behind, and using his snoot, flip the cat into the air. A surprise for the kitty, and great fun for Beaumont. They quickly learned to keep an eye on Bomey. He has been a joy and a delightful pet. Many inquisitive visitors to Doans did double takes when they came onto our porch and found Beaumont at one end, lying in the shade. "Did you know there is a pig on your front porch ? ", they would ask incredulously. I would reply, "Why, no", and hold the door for him to come in, which he always did.